This kind of timeline gives a lot more temporal information than the ones in these prototypes, but usually the programmer just wants something to grab onto that represents “all the things that happened when I clicked.” I'm searching for a timeline that can be on the screen all the time without bothering the user. It's easy to tell whether the code you're looking at has ever been executed, and whether it's been executed recently. The bar at the bottom is a convenient way to see the names of recent events. The information density potential is considerably higher than a more traditional timeline, such as the one in Chrome (shown on the right). People tend to see the white areas representing past execution as dissociated white blocks. When a function is executed, but it contains code that was not executed (for example, a branch of an if statement), I use a lighter shade of gray. I found when I used the same shade of gray as the rest of the unexecuted code, the function looked like it was sliced in two and it was jarring. However, everyone asks why there are two shades of gray. Dark lines connect the events in the list at the bottom to the shaded areas above them. 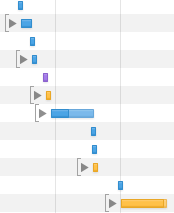 Old events are clustered together at the far right, leaving more space for the others. The most recent event is given almost half the screen so that it's likely to span most of the width of the code, strengthening its appearance as coverage. After talking with Rob, however, I think I'm going to give this idea a rest and try out some other ways of showing code execution. We're currently thinking of developing an icon language that can be used to the right of the code to indicate coverage, amongst other things. A recurring problem in my research is the inability to get inside a programmer's head while they're programming. People generally don't think out loud while they're programming. You can ask them to think out loud, but they don't always talk about the aspect of their thought process that you want to hear. You can ask them about their thought process, but that changes what they were thinking. I'm not nearly good enough at experimental design to tease all of those things apart yet. On the other hand, I know exactly what I'm thinking, right? 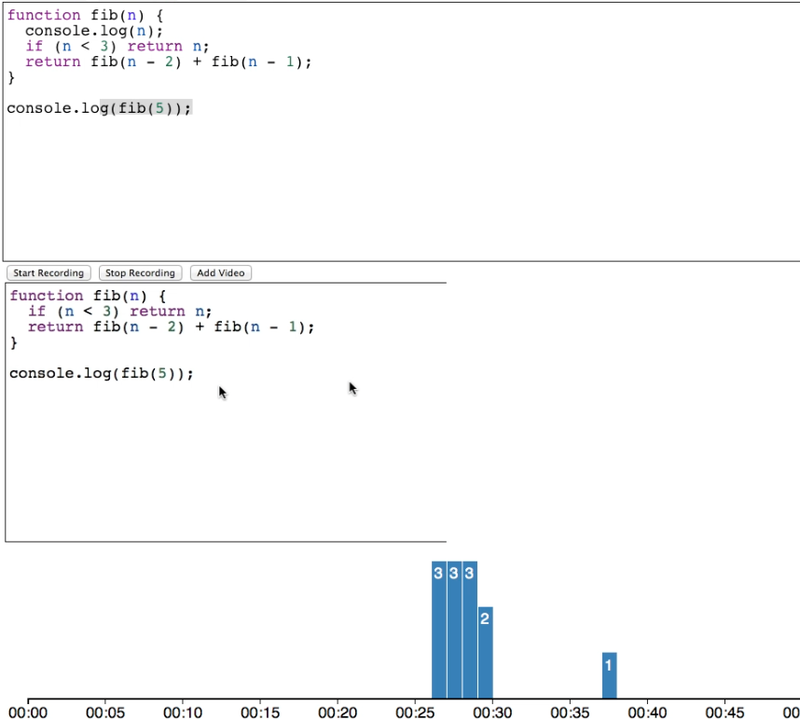 Well, I've tried analyzing my own thoughts while I program, but it doesn't really work. I can only think about one thing at a time, be it my programming problem or what I'm thinking about the programming problem, which leaves huge gaps. So I thought of a trick to get around that: record myself programming with a think-aloud protocol then watch the video later. Even if I don't say the "right" things, if I look at the video later I might remember enough of what was going through my head to do some sort of an analysis. So I recorded myself programming a snake game, and for the heck of it, I uploaded it to YouTube. I tried watching the videos immediately after recording them, but I found I was still too distracted by the programming problem itself, so I'm giving myself a little more time to forget what I did. Watching and hearing you code was fascinating, btw. … The order in which things happen, for one. The points at which you test. The way you look things up … and work through bugs. … You can tell people those things, but showing is better. The exercise didn't illustrate a programming language, but coding itself. Education: lecturers often write algorithms in class from scratch, and a tool like this could help students locate and rewatch parts of the lecture video more efficiently. Documentation: this idea is a little out there, but if people thought aloud about their code as they wrote it, this might be a form of code documentation that really allows you to figure out what the author was thinking when they wrote that abomination.